The Knowledge Exchange Institute gives you access to LSBU's expert knowledge, as well as unique funding sources like the KTP scheme, to help you turn your business ideas into real business opportunities. We can help you with business development, improving or introducing business processes and services, developing technologies, establishing new capabilities, and increasing efficiency. Our flagship programme is the Knowledge Transfer Partnership (KTP), which is supported by Innovate UK. For every £1 million invested in KTP, £4.8 million profit is generated and 30 new jobs are created. 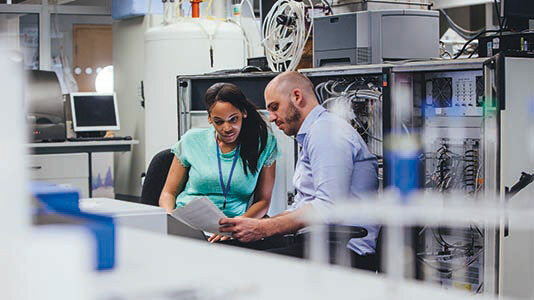 With up to two thirds of a KTP project being funded by government grants, a KTP is a three-way partnership between commercially-focused academics from LSBU, your business and graduate/postgraduate associate working full time on the project. The partnerships are designed to introduce and embed change within your organisation. Download our Knowledge Exchange Institute Brochure (PDF File 766 KB). Read about how we have helped organisations to implement change and grow. Exploring a brand new low carbon technology with Fulcrum Consulting. Calculating the financial value of social impact with the Construction Youth Trust. Streamlining the new product development process at Bond Display Cabinets. My company is just completing its second very successful KTP with LSBU. Not only have we managed essential change processes that benefit the company's efficiency and profitability, but have also gained a highly competent and valuable team member.